I've been taking Seratame for over 2 years for rls and this always works to stop my symptoms. Thank you. Thank you, Irene :) We are happy to serve you! I placed an order last night, well within the Black Monday sale. Please confirm that I did get the 40% discount on 6 bottles. This product has been a blessing for me. Do you still have the dark liquid in a bottle? I'm writing in to thank whoever put this supplement together. I've seen dramatic improvement with my constant RLS - not complete elimiation - but almost. No other drug or supplement has been able to help as much as Seratame. Cheers! Ron, we appreciate hearing about your experience. Thank you for such a nice writeup! I've used this Seratame for over 6 months now with success. I've found the best time to take is around early evening. We often tell our customers this as well. Especially if symptoms are primarily occurring at night. Best of health to you! I am intrigued by your product, having suffered from RLS and PLMD for most of my adult life. I already take may of the ingredients in your Seratame, but have not yet found relief. I read the description of your product, wherein you recommend the probiotic Lactobacillus plantarum 299. and state that it is included in your product. But when I looked at the label, I only saw Lactobacillus acidophilus. Thank you for taking the time to contact us! We certainly understand your concern and can assure you that we most definitely use Lactobacillus plantarum strain 299v in our formulation, as this is what reflected the most positive results in brain-iron uptake, among several other positive benefits, in several studies that we uncovered during our research phase into the formulation of Seratame. Please reach out to one of our support reps if you would like to see the full printout of the ingredient report that our lab is required by law to perform with each new batch of Seratame. We are always happy to provide this to our customers. I ordered this on a recommendation by a friend of mine who has RLS. I'm so impressed with how effective this formula is. I've been sleeping through the night for the past 2 weeks now after suffering for over 2 decades. Tammy we are glad you are having such great results! Thank you for the kind feedback. Thank you for making such a powerful product. I use it every night. It works very well. We're so glad to hear, Dorothy! Thank you for taking the time to write a review! OMG, I have suffered from RLS for over 40 years, trying all kinds of folk remedies, quinine, prescriptions (horrible side effects) exercise machines etc. My friend, who is a nurse suggested I try Seratame. I thought, "why not" so I ordered a bottle. That was 7 days ago and I have taken 2 every morning and I have NOT had restless legs ONCE! I am truly amazed. I slept 8 hours last night without waking up. That hasn't happened in years. Damiana, it's stories like these that keep us doing what we do. Thank you for sharing! I've been taking this product since 2016. It works for me if I take regularly. There are still some nights I will have episodes, but they are far less severe and it seems to keep them from happening too often. I am very satisfied. Thank you, Gary. We loved reading this review! I wish I could say it worked for me. I heard about these from my sister who swears by this product. Sending them back for a refund. We're sorry it hasn't been much help to you, Joy. I wish we could say it always works for everyone but that just isn't the case. Thank you for trying and yes, please return for a refund. I am writing with good news about your product. I no longer have severe RLS as I once did after using and will continue to use as long as I am getting this type of relief. Thank you for such a great product. 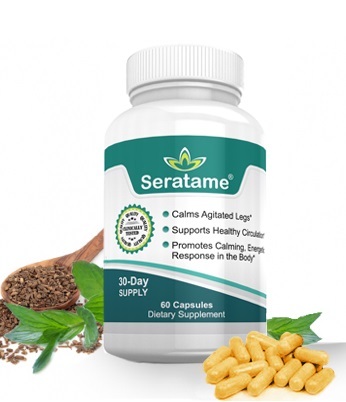 We're so happy you've found relief with Seratame! I used to use Hylands for years until I found Seratame. This has been far superior than anything I've tried and I've noticed a lot of other nice benefits from taking regularly as suggested. I have been spreading the word about this product to a lot of my friends. Thank you Pat. So happy to know this! Seratame has worked quite well for me I amordering more. Thank you for your kind feedback, Oscar. I wasn't seeing a difference at first but I wasn't being consistent. I believe it takes a little time as well because once I began taking these on a regular basis just before dinner as they suggest, I noticed my symptoms began lessening. Enough to the point now where I don't really have a bad night - which is a big deal for me as I've suffered for over 20+ years with RLS and spasms. I don't know what is in this that makes it work so well but I'm going to continue taking as long as they work. Thank you for your wonderful testimonial, Leann! 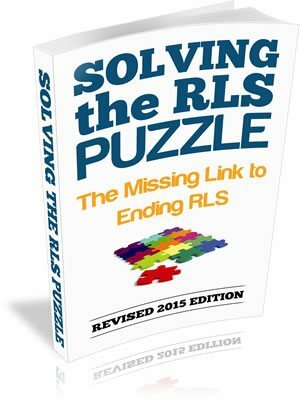 I've dealt with RLS for over 30 years of my life now. I tried all the remedies out there. Seratame is the only one that actually works. Thank you for a great product. Thank you, Stephanie. We're so glad to hear from you! I didn't have dramatic reduction of symptoms while taking Seratame. I was recommended it by a chiropractor who uses it for her patients with RLS and was hoping it would work for me too. Unfortunately, I will have to keep looking. Cherlyn, thank you for giving Seratame a try and we hope you find the relief you are looking for. I found this a couple years ago and still it's the only thing that has worked on my RLS. I'm happy with the product. Thank you Samantha we're so glad you enjoy it! There is major improvement in my RLS since taking Seratame. I also find it helps when I have had a horrible night of sleep and I'll take extra in the daytime. It seems to calm the nerves down and help me feel relaxes. Alyssa, so glad to hear! Thanks for reviewing. Worked at first, but then hasn't seemed to help since the first week of taking. Does this normally happen? I'm sorry it wasn't what you were hoping for, Leigh. Have you read the ebook that came with your order on the diet and lifestyle changes to help support you?